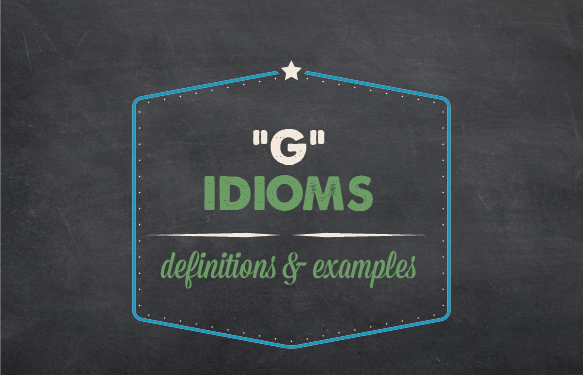 Idioms starting with the letter "G"
There are many American idioms and this list contains definitions and examples of idioms that start with the letter "G" (the main word in the phrase starts with a "G"). It's a great place to start but don't worry, I've also listed American idioms beginning with other letters and you can click here to go to the main idioms page. Before you get started, let's make sure that you understand what an idiom is. An idiom is a group of words whose meaning is different from the individual words if you looked them up separately in the dictionary. Let's "get real." If you really master the English language, you need to learn a lot of idioms. List of American idioms starting with the letter "G"
More examples of American idioms starting with the letter "G" will be added in the future so make sure to sign-up for my free newsletter so you can know when there are new updates. 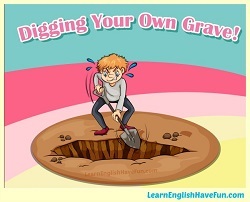 You can also find many American idiom definitions with Merriam-Webster's online learner's dictionaries. I've tried to "get through to you" just how important idioms are. And now I'm going to "give it to you straight." You have to practice to learn and remember English. You cannot master the language without using it (and making mistakes). So now it's your turn to practice. Don't worry if you make a mistake, I will help correct your sentence. It's that easy. Please write an example or two by picking any expression from the American idioms list above.